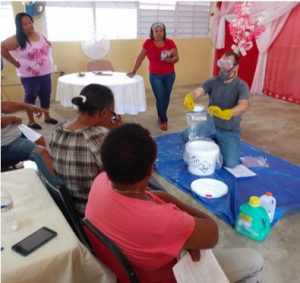 Andrew Robertson instructs community leaders in a train-the-trainer session on packaging donated chlorine disinfectant for individual household disinfection and mold removal in Canóvanas, Puerto Rico. Caribbean hurricanes Irma and Maria of the 2017 season, now distant memories for many, remain top of mind for Puerto Ricans who are still recovering from those historic storms. During the hurricanes, many homes in Puerto Rico flooded with contaminated water. Worse, many homes had their roofs blown away, so every time it rains, the homes flood again. Water finds its way under roofs and in walls and ceilings, causing a major infestation of mold and other microbes. Through a donation of 4,000 pounds of chlorine disinfectant from the American Chemistry Council’s Chlorine Chemistry Division and a partnership with the Water Engineers for the Americas (WEFTA), the people of Puerto Rico learned first-hand how chlorine chemistry can help them recover from the Hurricanes. WEFTA engineer-volunteer Andrew Robertson and his daughter Kati traveled to Puerto Rico. They visited five communities with a combined population of 10,000 people to help residents learn how to disinfect their homes using a granular chlorine product NaDCC. Their strategy was to identify local leaders in each community and train them on how to (a) safely package the disinfectant into smaller portions, and (b) use the disinfectant safely in the home. The leaders were then responsible for distributing the chlorine and teaching their neighbors on how to use the disinfectant in their homes safely. These trying times in Puerto Rico underscore the importance of organisational partnerships, such as this one, which facilitated recovery from natural disaster with the help of chlorine chemistry.